As a kid, I remember eating spaghetti with meat sauce on a regular basis. This was always one of my favorite meals my mom would make. There was something incredibly satisfying about sitting down to a bowl (or three) heaped with noodles and a rich meaty tomato sauce, all topped with grated cheese. I like to think of this dish as that favorite childhood meal of mine, but taken to another level. The Oxtail gives the dish a rich, velvety texture, and deep, complex flavors. As the meat and sauce simmers away, your home will be filled with the inviting, familiar smells of the meat, herbs, and aromatics melding together. 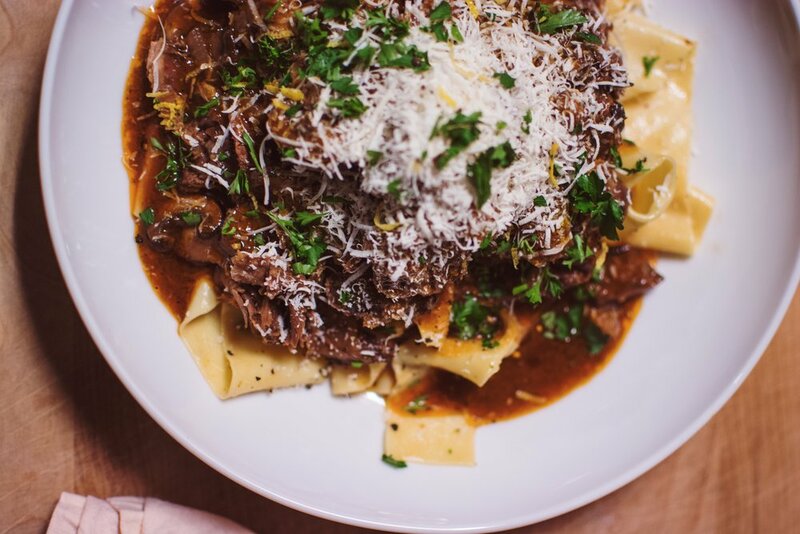 Combine the luxurious Oxtail meat sauce with fresh pappardelle, and you will be rewarded with a meal that you and your family will undoubtedly love. Heat a large Dutch Oven over medium-high heat. Season the Oxtail with salt and pepper and roll in the flour t lightly coat. Add 2 Tablespoons of oil to the Dutch Oven and heat until shimmering. Add the Oxtail to the pot, working in batches to avoid overcrowding. Brown the Oxtail on all sides (3 to 5 minutes per side). Remove and set aside on a plate. Add the carrots, onions, and celery to the pot. Cook for about 8 minutes, or until the onions are browned. Add the garlic and cook for about 30 seconds. Move the vegetables away from the middle of the pot, leaving an opening to add the tomato paste. Cook the tomato paste until it begins to caramelize, about 2 minutes. Be careful to not let the tomato paste burn on the bottom of the pot. Add the wine to the pot, making sure to scrape up the browned bits on the bottom. Cook until the wine has slightly reduced, about 5 minutes. Add the Oxtail back to the pot. Add the beef stock to the pot, and enough water to almost cover the meat. Bring to a boil, then reduce the heat to low. Add the bay leaf, thyme, and rosemary to the pot. You can use kitchen twine to tie the herbs together, as this will make removing it much easier later on. Cover the pot and simmer until the meat is very tender, about 8 hours. Check throughout the cooking process to make sure there is still liquid covering the meat, and add more if needed. While the meat is cooking you can make the Pappardelle (See Recipe). When the meat is tender use a slotted spoon to remove each piece from the liquid. Pick all of the meat from the bones and set aside. Make sure you have removed all of the herbs, meat and bones from the liquid. To create the sauce, using a blender or immersion blender, puree the liquid and vegetables remaining in the dutch oven. Add the fresh pasta to each plate and top with a portion of the meat. Spoon the sauce over the meat and pasta, then grate fresh parmigiano-reggiano on top. Garnish with fresh chopped parsley. *You could replace Oxtail with any cut that requires a long braise.